Appreciated among our customers across the nation for supplying, trading and wholesaling a board array of high effective Pharmaceutical Products, Vibdrugs Biosciences started its operation in the year 2014 at Chandigarh. The product range offered by us is inclusive of Azithromycin Tablets, Cefuroxime Tablets and Drotaverin Tablets. In order to ensure high standards of quality, the offered range of pharmaceutical products is procured and sourced from trusted and reliable vendors of the industry. Processed as per the FDA set norms at the vendors’ end, these pharmaceutical products are used in various hospitals and medical clinics for the purpose of treating various life threatening diseases. Backed with a team of efficient workforce and rich vendors’ base, we have been able to cater to the needs of our valuable customers in the most efficient manner. Hold expertise in their area of operation, our employees work in close coordination with each other to avoid any hassles in the workplace. Our vendors make of cutting-edge and state-of-the-art machinery and quality assured ingredients for the purpose of processing the offered range of pharmaceutical products. Hassle-free modes of payment and prompt delivery are offered, keeping the ease and convenience of our customers in mind. We were established as a sole proprietorship firm and are operating under our proprietor, Mr. Amit Rawat. Supported with his knowledge and experience of this domain, we have been able to cater to a huge clientele across the nation. Under the leadership of our owner, Mr. Amit Rawat, we are backed by an efficient and hard working workforce. Our team at Vibdrugs Biosciences comprises procurement agents, skilled & semi-skilled professionals, logistics experts, warehousing & packaging professionals and other supportive staff. Hold expertise in their area of work and by working in close coordination with each other, our team of skilled professionals ensure a trouble-free working environment. Eye for details and commitment towards work of our employees has helped us in catering to the needs of our valuable customers. We under the guidance of our proprietor, Mr. Amit Rawat have been able to meet the bulk orders. It is possible owing to our capacious warehousing unit and rich vendors’ base. With state-of-the-art infrastructure and efficient workforce, our vendors hold expertise in offering best quality range at affordable prices. Hold expertise in their area of operation, our vendors are selected by our procurement agents based on the quality of the products, company reputation in the market and ability to meet the bulk demands of our vendors. Quality, being our utmost priority, it is maintained at all the times through various quality assurance test conducted by our team of quality controllers. For this, we procure the offered range from trusted vendors of the industry, who hold expertise in their area of work. By appointing a team of quality controllers, we ensure to provide our customers with highly effective range of pharmaceutical products. In order to enhance their quality testing skills, our quality controllers are provided with regular training sessions. 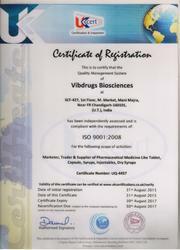 We are ISO 9001-2008 certified company. We have implemented different customer-driven approaches at Vibdrugs Biosciences, under the expert supervision of our mentor, Mr. Amit Rawat, driven by an intense desire to attain maximum customer satisfaction. Delivering the offered product range at the customers’ end with the assured time frame with the aid of our excellent transportation facility has helped us in winning the trust of our valuable customers. By incorporating various transparent transactions policy, we have been able to cater to a commendable position in this domain.